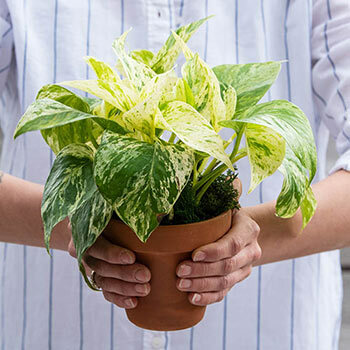 Pothos are always dependable houseplants, but Marble Queen adds another element to the mix—a gorgeous marbled green-and-white pattern on the leaves. Keep it inside on a shelf or in a hanging basket and let the long vines trail down the sides, or bring it out by the patio and let the tropical vines create your very own oasis. It grows quickly in shaded or partially-shaded areas but does benefit from some indirect sunlight, especially during the winter. The Marble Queen Pothos only needs watering 2-3 times a week, just enough to keep the soil moist but not saturated. 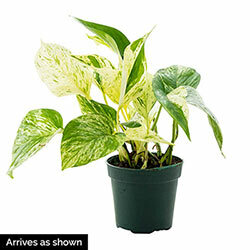 During the colder months, lightly mist its leaves from time to time to keep it happy and thriving. Because it's so easy to keep healthy and growing and such a beautiful feature, this is a good housewarming gift for the first apartment.